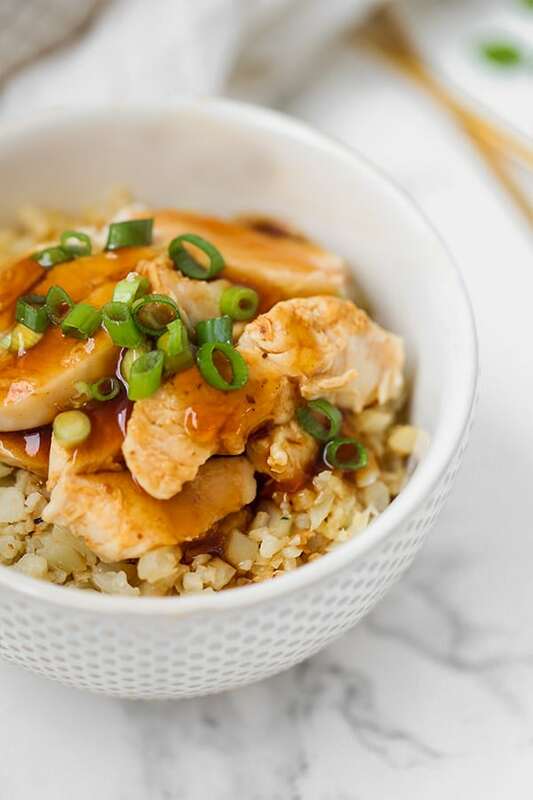 This slow cooker chicken teriyaki makes dinner easy! Serve it with some veggie sides, and you have a flavorful meal. It’s made without soy sauce and is paleo, AIP, and whole30 compliant. I often share on the blog and on social media how I rarely ate animal protein before I went paleo/AIP. I hated the texture, the flavor, and just everything about it. The only way I would eat chicken was if it was chicken nuggets (hence my crispy chicken nugget and sweet potato chicken popper recipes) and chicken teriyaki! Chicken teriyaki is so flavorful, and when cooked right, the chicken is tender and delicious. 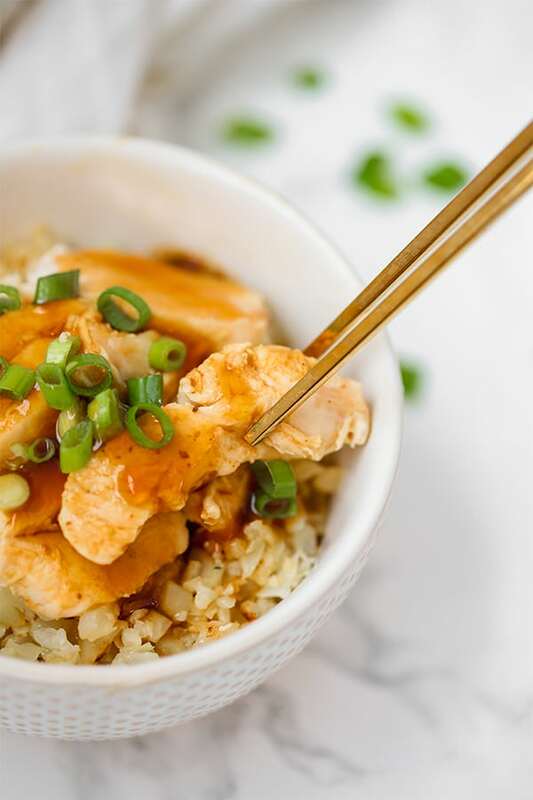 You can easily make chicken teriyaki on a stove top, but why not make it easier with a slow cooker? I love making slow cooker meals for simple weeknight meals, or easy meal prep. It’s less time consuming than standing around cooking something on the stove top, and it makes for a tender and delicious meal! 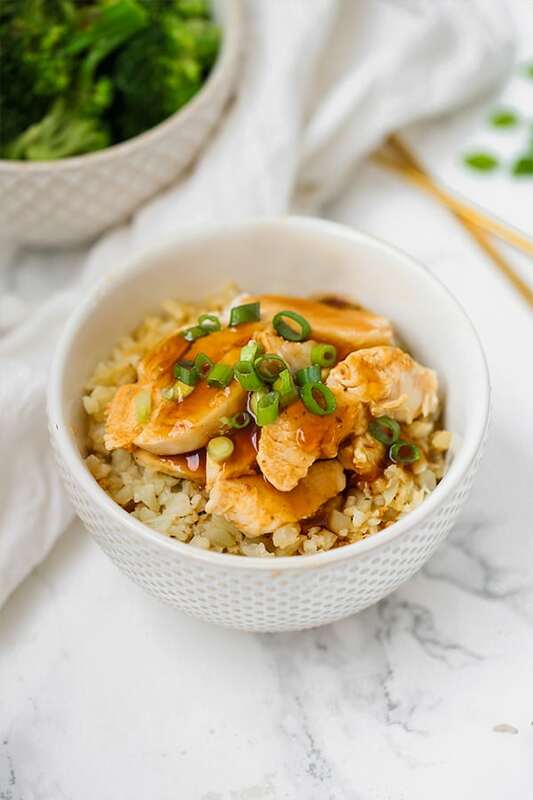 This chicken teriyaki is a slow cooker staple that I’ve been adding to my weekly rotation. On top of being easy, it’s also filling and healthy! It’s not loaded with MSG, soy, or cane sugar like most chicken teriyaki you would find in a restaurant is, but it still tastes amazing. I serve this chicken teriyaki over a bed of cauliflower rice with the teriyaki sauce. It’s the perfect swap for white rice while adding in more veggies. Steamed or roasted broccoli is another great side dish, as well as my oven roasted baby bok choy. Any of these sides will help to round out the dish and make it a complete meal! You can also use thigh, but I think chicken breast is the best option for this dish. Coconut oil keeps the chicken moist. You can easily use other cooking fats as well! This is the swap for soy sauce. You can find this online, and in most health food stores. Omit the honey for Whole30. This thickens the teriyaki sauce. I would not sub tapioca starch as it will make it a lot more gummy than arrowroot starch. I’m obsessed with my instant pot. It’s my favorite way to cook chicken, and this recipe can be used for either the slow cooker or the instant pot. You can either use the slow cooker function on the instant pot and follow the recipe as it, or just cook on high pressure for 15 minutes for an even faster dinner! Prepare the sauce by whisking together the ingredients in a small bowl. Set aside. Add the chicken breast to the slow cooker and top with the coconut oil, and teriyaki sauce, making sure the chicken is well coated. Turn the slow cooker (or an Instant Pot set to slow cook) on low and cook for 8 hours. Remove the chicken from the slow cooker and either shred with two forks, or slice with a knife (I prefer to carefully slice). Top with the remainder of the teriyaki sauce and chopped green onion. Serve with cauliflower rice, steamed broccoli, baby bok choy, or other side dishes of your choice! To make in the Instant Pot, either follow the instructions and use the slow cooker function, or cook on high pressure for 15 minutes. Are you taking new clients? I’m in the Dallas area also. DELICIOUS! Omitted the oj and served with broccoli, green peas and brown rice for me and my kids. My AIP hubby had it with stir fry veggies, and really enjoyed such a flavorful meal! Thank you so much Christin! I am so happy you liked it! Do you only add in half the teriyaki sauce when you put the chicken in the slow cooker? The sauce was wonderful! I have a new slow cooker and set it to low for 8 hrs – it was definitely waaayy too long! The chicken was soft but definitely overcooked and looked almost burnt. I will adjust the time in the slow cooker and try again because my husband (who loves teriyaki and is not on AIP) really enjoyed this!